Increasingly rare in the wild, these little onions can be cultivated by any farmer who possesses a bit of forested land - and a whole lot of patience. Ramps (Allium tricoccum) resemble a more delicate scallion and have a flavor reminiscent of garlic, onions, and leeks. With a sweet pungency that combines the flavors of garlic, scallions, and leeks, ramps (Allium tricoccum) have become something of a rare delicacy as rising demand depletes the natural supply. Unfortunately, harvesting the bulbs – which grow wild in forests from Minnesota to Maine and as far south as Georgia – effectively kills the plants. Even worse, this particular plant can take seven years to reach maturity. It’s why Great Smoky Mountains National Park banned ramp-foraging in 2004, and why horticultural scientists at North Carolina State University have been researching how farmers might help ensure a robust ramp population. A good portion of the land in the eastern United States is forested and thus too shady for conventional crops – yet ideal for ramps. True, you won’t be able to reap what you sow for five to seven years (three, if you plant bulblets instead of seeds), but you’ll be using otherwise fallow acreage to produce a crop that brings in about $15 a pound. Though officially hardy in Zones 3 to 7, ramps require a specific woodland habitat: shady and damp (at least 35 inches of rainfall throughout the year), with well-drained, acidic, calcium-rich soil. These same conditions are favored by trilliums, trout lilies, and mayapples, so if you notice an area where those plants thrive (likely under the shade of beeches, maples, hickories, or oaks), you’ve found the perfect place to cultivate ramps. Sow seeds in early fall, spacing them 4 to 6 inches apart and pressing them into the soil with the palm of your hand. Or speed up the process by planting bulblets, 2 to 3 inches deep, in early spring, just after the ground has thawed. Either way, mulch with a 2-inch layer of hardwood tree leaves, and use overhead irrigation during dry spells. Michael Anthony, executive chef of Manhattan’s Gramercy Tavern, included this dish in his book V is for Vegetables. Cook pasta in a large pot of salted boiling water until just tender, then drain (reserving ¼ cup of the cooking water). Return pasta to pot and stir in 1 tablespoon oil. Heat remaining 3 table-spoons oil in a large skillet over medium heat. Add ramp whites and red pepper flakes and sauté for about 2 minutes. Add ramp greens, spinach, basil, and oregano, and season with salt and black pepper to taste; cook for about a minute more. Add pasta, reserved pasta cooking water, and cheese, then toss to combine. 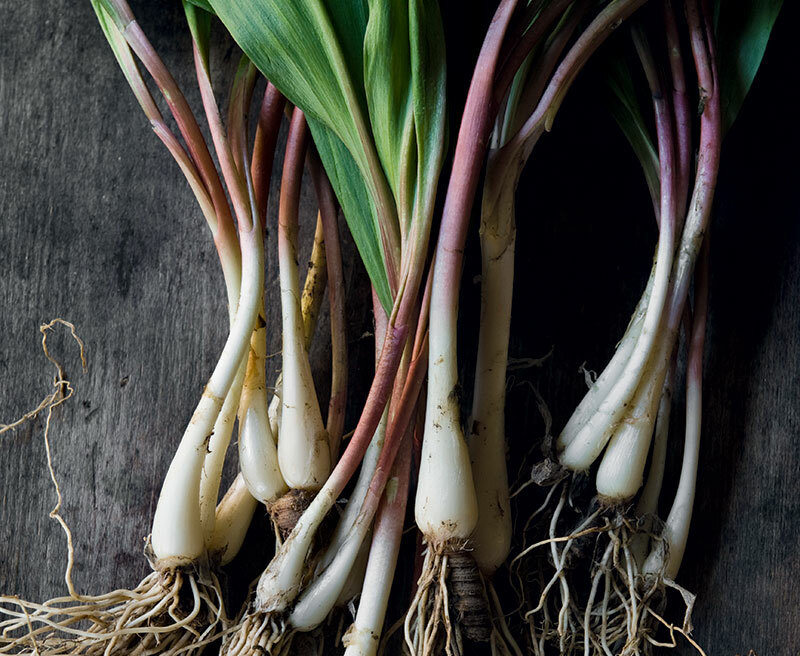 Ramps should be harvested in spring, five to seven years after planting seeds and three to five years after planting bulblets. You’ll know the plants are mature when their leaves reach heights of 6 to 8 inches. It’s also worth noting that there’s a market for the mildly flavored leaves, which can be harvested at 5 to 6 inches tall, three to five years after planting seeds and at least two after planting bulblets. Simply pinch or snip the leaves off just above the soil line. There’s limited data, as few growers had the foresight to get started a decade ago. But ramps could be profitable for farmers willing to play the long game. Buy seeds year-round and bulblets in late winter at rampfarm.com and mountaingardensherbs.com. For more information, consult Having Your Ramps and Eating Them Too by Glen Facemire Jr. Growing and Marketing Ginseng, Goldenseal and Other Woodland Medicinals by W. Scott Person and Jeanine Davis is another great resource. Recipe excerpted from V is for Vegetables, copyright © 2015 by Michael Anthony. Used with permission of Little, Brown and Company, New York. All rights reserved.